Bluestone Designs & Creations, Inc. was stablished in 2001, we are a team of dedicated and experienced design professionals. Based out of our New York office, we work with reward industry clients and museum curators around the world. Here are some stories we want to share with you. Replica of the “Swan” by Boehm Porcelain, Trenton, NJ. 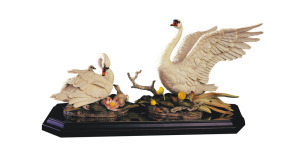 The original piece was the national gift from Nixon to Mao Zedong on his first visit to China. Currently the original piece is displayed at the Friendship Museum in Beijing. We were authorized by Beohen Porcelain to replicate to commemorate the 30th diplomacy of the US and China, solely sold in China market. The replicate is cold cast ceramic and hand painted. Replica of the plaque at the imperial court at the Forbidden City, Beijing. This replica was given to Bill Clinton during his first visit to China. 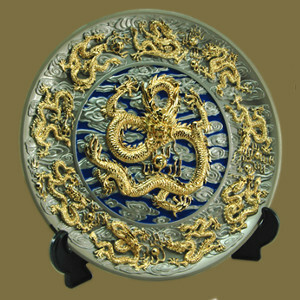 Replicate of emperors “Nina Dragon Plate”, received by Putin during his trip to the forbidden City, Beijing. “Busting Bronco”, replicated in both bronze cast and cold cast ceramic hand painted, of the original piece done in porcelain, at the Bush Library. Bluestone Designs & Creations, Inc.